Mary Lee asked me to be "guest blogger" for Poetry Friday today. It is funny being a guest blogger on our own blog. But, Mary Lee is having her gall bladder removed this morning and did not feel so poetic. I worked long and hard to find or compose a poem about gall bladders but they are not easy to find (or to write). So, I thought I'd celebrate Poetry Friday by sharing 2 great new poetry books I picked up at Cover to Cover. SWITCHING ON THE MOON: A VERY FIRST BOOK OF BEDTIME POEMS is a collection by Jane Yolen and Andrew Fusek Peters. The book is illustrated by G. Brian Karas. This anthology is a great companion to one of my all time favorite poetry books, HERE'S A LITTLE POEM by the same authors. This book is the same size--big and fun. The font of each poem is big enough for little readers, and although the illustrations are done by a different illustrator, they are perfect for this book--a happy night time feel. 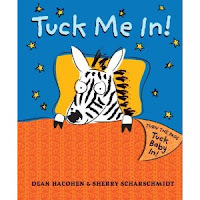 This is an amazing collection of poems for young children--for bedtime or anytime of the day. So excited that these two collaborated on another "Very First" book of poetry. The other fun poetry book I had to have was GUYKU: A YEAR OF HAIKU FOR BOYS. I really did not even have to open the book to know I wanted it. The title made me smile and I saw that Peter Reynolds was the illustrator. I knew I would love it. This is as great of a book as I expected. (Even the dedication page is done in Haiku.) It combines Haiku and fun and will definitely appeal to boys (and girls, too!). This book goes through the seasons, celebrating things boys enjoy (or things they don't like sisters..) At the end of the book, the author, Bob Raczka shares his thinking about why he wrote GUYKU and why Haiku is a wonderful form of poetry for guys. He has great points and I think he is right! The Poetry Friday Round-Up today is at Bibliofile. In a brilliant marketing move, Albert Whitman & Company has jumped on the current SillyBandz craze and created packages of Book Bands that are "collectible shaped rubber bands" that go with three of their most popular series: Boxcar Children, Zapato Power, and The Buddy Files. Thank you, Michelle Bayuk, Director (Extraordinaire) of Marketing at Albert Whitman, for sending enough of these to share with my students, thereby elevating me to Coolest Teacher Ever. Today, we had a Teacher Sneak Peek at the Book Fair. Teachers came in before school, browsed the books and created Wish Lists. And, of course, we had some food. If you are looking for a great and easy fall recipe, the Apple Dip I made was a huge hit. It is the quickest, easiest thing I have ever made. I got the recipe from my neighbor over the summer and have made it several times since then. I have no idea where it originated but I would love to thank the person who figured out this combination of ingredients. I use a regular size pie plate to serve this in. Take 1 cup of brown sugar and 1 large container of whipped cream cheese. Mix these together with mixer. Spread this onto bottom of pie plate as 1st of 3 layers. For the second layer, use a large container of caramel apple dip. Microwave it a bit until it is spreadable and then spread it on top. Finally, for layer 3, cover caramel dip with mini-chocolate chips and crushed Heath bars. Use enough to completely cover the caramel. Michael Grant visited our school last week to talk to the our 4th and 5th graders about his new series, THE MAGNIFICENT 12. If you haven't seen the series, yet, the first book (The Call) came out in late August. The first book in a series sets up the story. Mack MacAvoy is your average 12 year old kid. But he is also someone who seems to get in trouble with bullies often. One day at school. Mack is visited by someone who tells him that he is one of the Magnificent 12 and that he must find the other 11 kids who will make up the Magnificent 12 and save the world. The humor in this book is the best. Michael Grant does a great job of making this funny to readers of all ages. The thing about his humor is that it is spread throughout the book and it is that surprising, laugh out loud humor. I found myself laughing aloud several times while I was reading it. George from the Dublin Branch Library shows off his new books! Michael Grant's talk to our students was amazing. If you ever have a chance to hear him speak or to have him at your school, it is quite a treat. His talk was about 20 minutes and hysterically funny. He seems to totally understand this age group and creates a talk that keeps them engaged and excited about the book. Following the talk, he autographed books. George from the Dublin Library joined us so that he could hear the talk by Michael Grant and pick up a few copies of the book! The book has a great website that has some great features. I think fantasy is often new to readers of this age. Creating a visual of the various settings and characters is sometimes hard. The website provides info and reminders about these characters that are helpful when reading (and amusing too). Lots of other features make the site appealing to kids. Our 4th and 5th graders love this series and are already looking forward to the 2nd in the series that comes out next August. The book trailer gives gives you a sense of the book too. You can read more about the Magnificent 12 from Bill at Literate Lives and from Tony at Learn Me Sumthin'. Photo Sharing in the Elementary School: Is It Worth the Time and Energy? I think many of us in the elementary school are overwhelmed by all that is possible with technology. We want our students to have great opportunities but we don't want to use technology for technology's sake. So, we have to be picky about the tools we commit to. With so much else to do in the elementary classroom, is Photo sharing worth the time for teachers and students? What are the benefits to our students? I have always understood the importance of images and the need to have a "photo library" of sorts for kids. But until exploring Flickr this week, it merely seemed like one more thing--one more huge thing to add to my list of things to figure out. I could never understand the reasons a Flickr account might be important for elementary students. Most of my work this week has been in trying determine the benefits of Flickr for elementary school. I went into the week wondering if Flickr is really a tool that is worthwhile for elementary students. With so many other tools available, is it really important that our students have access to photo sharing tools such as Flickr? One article that impacted my thinking was “The Promise of Social Networks” by Derek E. Baird on Tech and Learning. In it, he says, "Today’s students have grown up surrounded by the digital world, and as a result they have developed new ways of understanding, learning and processing information. As new types of social media are developed, teachers will need to find new and innovative ways to harness the power of these technologies to enhance their curriculum, and support differing learning styles. Flickr holds great potential as part of a multi-faceted approach that blends learning theory and social technologies in the curriculum." I have heard about many schools and libraries with Flickr accounts but they seem to be mostly for public relations purposes. Much of what I read about Flickr and libraries tended to talk about how Flickr could raise awareness and communication about your library or classroom . Although I see this as one possible use of Flickr, I think for it to be worth the time, it must have an impact on student learning. My youngest daughter is a perfect example of this. She is in 5th grade and blogged quite a bit this summer. She has a blog called FUN THINGS TO MAKE and I was alarmed to realize how she had taught herself to take photos and put them right into her blog. I quickly showed her how Flickr worked and taught her to do an advanced search looking for Creative Commons photos. This box in the advanced search allows for searching of only photos licensed by Creative Commons. I also showed her where to find the information on who took the photo. After the initial whining about having to do something that didn't sound fun (she had already found her photos after all) she realized how many great photos she could find on Flickr. After seeing how easy it was and how many great images were available, she went on to use photos from Flickr to create a birthday invitation and other projects. Now she would like her own Flickr account. Teaching about Creative Commons is only one way I can see Flickr being used in school. If a school or classroom has a Flickr account, students can begin to build a photo library of the school year. Photosharing safety could be addressed in a very authentic way as students determine which photos from the field trip should be put into the Flickr account. With a Flickr account, students can learn about tagging items for future use and for sharing purposes. They can learn about citing sources and about licensing their own photos. I can see Flickr as a very easy way to teach so many of the skills we want our students to have when working with all kinds of media. And if we teach them early, our students will be able to use these skills for life. As an elementary librarian, it seems critical that our students have access to photo sharing tools such as Flickr. So much of the work that they are doing relies on images and having access to a photo sharing site can help students learn to use these in an ethical, responsible, and safe way. -add photos from classroom, school and other events. When a group goes on a field trip, we can determine as a class which photos get downloaded and how to tag them. After we finish a science experiment, children can choose to include photos. For school events such as assemblies and art shows, a team of students can choose photos to be placed on the Flickr account. We can create sets and collections when appropriate. Over time, I see the library of photos building quickly so that students have a huge variety of photos to use in projects--photos that connect directly to the curriculum they are studying. Adding photos will also provide a great opportunity to help students understand district guidelines of not posting student faces online. -learn about Creative Commons licensing. 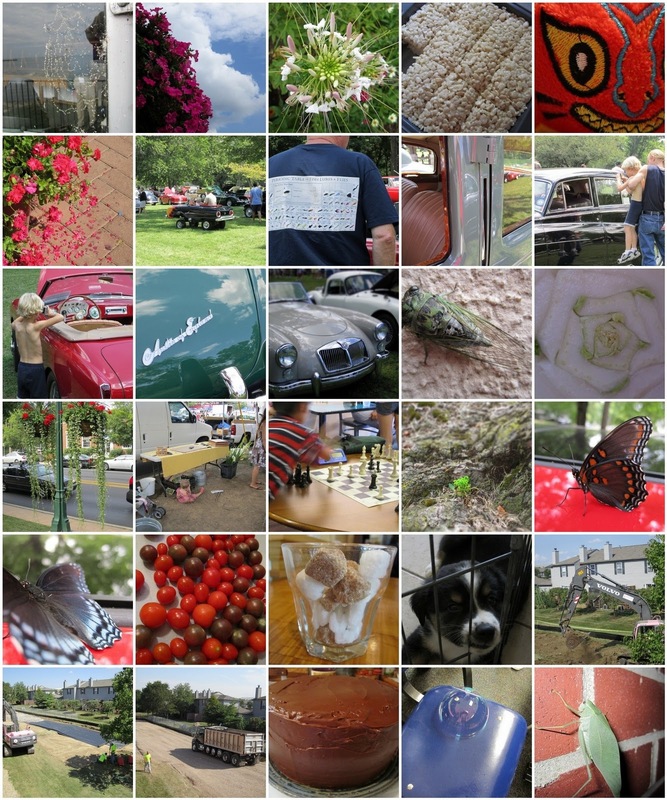 By adding photos to our Flickr library and learning to use the Advanced search options on Flickr, students will begin to understand the ethical responsibilities of using and posting images. -tag photos and learn about tagging and organizing. This will be an important skill students can learn from participating in a Flickr account. -have conversations around responsible posting of images of others can be taught as groups of students work with teachers to determine which photos from events to post. Determining which photos are acceptable for public sharing and how to stay within our school's guidelines and agreement will help students' see their own responsibility with their work. There are definitely things to be aware of if using Flickr. First of all, it is a self-monitored site so there is the potential that an inappropriate photo will be found once in a while. Flickr is blocked in many schools, as are many image sharing sites, and although Flickr is listed in many articles as one of the most child-friendly photosharing (http://photography.families.com/blog/best-places-for-photo-sharing-on-the-internet) sites, there are other options for educators. One such option is SMUGMUG. These other sites provide some different options but the Creative Commons tools are not as easy to navigate or as global as in Flickr. Flickr is a tool that is easy for young children to navigate and learn with. I now see the benefits of a Flickr account for elementary schools and libraries. I think it is imperative that our students have access to safe ways to contribute and use images in this way. I agree with Will Richardson when he says, "Personally, I think Flickr is one of the best sites on the Web. It's true social software where the contributors interact and share and learn from each other in creative and interesting ways. And for that reason, it's educational potential is huge." (Blogs, Wikis , Podcasts and Other Powerful Web Tools for Classrooms, p. 102) I think the possibilities for teaching are endless and a school library account would be a great scaffold for our youngest students. By understanding the issues and concerns about images on the web and also seeing the possibilities for student learning, I am convinced that Flickr and other photo-sharing sites are not just one more thing to learn. Instead photo sharing sites like Flickr can support our students as they learn incredibly as they learn about creating and using visual images. 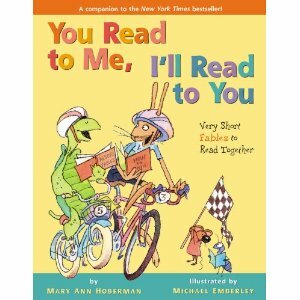 At ALA last June, I got the chance to tell Mary Ann Hoberman that she is a rock star in my classroom. On Poetry Fridays, her You Read to Me, I'll Read to You books are the most popular books on the poetry shelf in my classroom. And why not? They are so fun, and perfectly designed for buddy reading. They are easy enough for struggling readers to figure out, and easy enough for confident readers to read with dramatic expression. They are well enough known that sometimes the audience joins in the performance! This newest volume is a welcome addition to the set. The fables Hoberman chose to include are well-known or have an easily-understood moral. Emberley's illustrations start telling a story of their own from the title page on. Fun, fun, fun! There's more fun to be had today at the Poetry Friday Round Up. Karen, at The Blog With the Shockingly Clever Title, is hosting today. 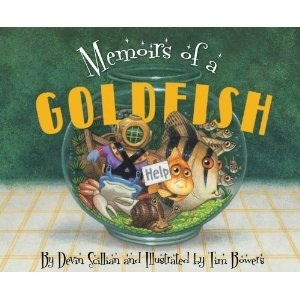 My good friend and colleague Nicole, told me about this new book called MEMOIRS OF A GOLDFISH. As she was telling me all about it and why her 2nd graders loved it, I knew I had to have it. I picked it up last night and my 5th grade daughter had just heard it read aloud and she said it was hysterical. This is one of those books that will be great for many ages. It will make a great read aloud for the library. The story reminded me a bit of the Diary of a Worm series by Doreen Cronin in that it is a diary format. I think kids who are fans of that series will enjoy this book too. This a 14 day "memoir" of a goldfish and the events that happen to him in his bowl. Day 1: I swam around my bowl. Each page/day gets a little longer and more complex as Goldfish's life gets a little more crowded. He is quite funny and his voice make the book amusing. I can see using this book when talking about personal narrative. There is lots to learn about first person writing and about sharing events and feelings by the fish in this book. Kids of all ages will laugh out loud at this one. I imagine it will be a popular one in the library. As you know if you read my blog posts, I love new songbooks. I think they are quite fun and I also know how important they are for early literacy development. When I heard about THERE WAS AN OLD LADY WHO SWALLOWED SOME BUGS by Johnette Downing, I ordered it immediately. I love all of the different versions of this story/song. And this one is a bit unique. The story follows the typical "There was an old lady" format and in this version, the old lady eats a variety of bugs including a mosquito, a worm, a slug and a roach. UGH! The illustrations are unique in that you don't see the entire Old Lady getting bigger and bigger. Instead, each page focuses on the tongue and the stomach--close ups of the "old lady" eating each bug and them gathering in her tummy. But this one has a fun surprise ending that I think kids will love. The text of this one is a bit tricky in that some pages contain a lot of text and some of the bug names might be unknown to young kids but I think this book will be enjoyed by kids of all ages--a fun version of a well-loved song! In the library today, I overheard one of our second graders with a new student. She was walking around showing her the library and helping her look for a book. The new girl was not having any luck finding a book. So the "tour guide" turned to her and said, "Tell me about a book that you really really really love and I'll help you find another one." I say that to kids all the time but didn't realize it until I heard this second grader saying it! Crack me up! It was too cute. Have I mentioned lately that our public library system, the Columbus Metropolitan Library, won Library Journal's 2010 Library of the Year Award? We are SOOOO lucky to have this library system in our community. I imagine we take the library for granted at times and we probably shouldn't! I have to admit that I don't visit many of the library's branches. I need to make some time to get downtown to the main branch. But our Dublin branch is so good and I always bump into one of the children's librarians there, that it is the one I visit most frequently. The 3 children's librarians at the Dublin Branch have been so supportive of our school and we have done great partner activities over the last few years to build relationships between the students and the librarians there. The 3 are all very familiar faces to our students and at least once a week, some child comes in to tell me that they talked with one of them on a recent visit to the library. As I move into my third year, I am able to bump things up a bit in terms of student learning. This year, when Loren Scully and I met to set our year plan, one of the goals was to help students be more independent at utilizing the tools at the public branch library and to help them know the resources available. So, this week, Ray, the teen librarian at Dublin, spent time with every 4th and 5th grade class. He spent about 35 minutes with each class, giving them a tour of the CML website and some of the resources they could find there. He demonstrated how to go about reserving a book that they were hoping to read. He also shared some resources available to the community such as CultureGrams. Kids learned how to search available books by favorite authors and more. And, of course, Ray can't leave the school without sharing some great new books with kids. He is so knowledgeable about books for this age group that many kids found new books to add to their "to be read" list. The kids were GLUED to his talk. They seem excited to explore the CML website on their own. I have to spend more time on it myself--there is so much there--really amazing resources. I know the librarians are hugely busy and we appreciate the time they give to the students at Riverside. Our kids LOVE when they see one of the Dublin librarians whether they are at school or at the Dublin Library. Our students love anything connected with the library because of this. I enjoyed MIND YOUR MANNERS, B.B. WOLF by Judy Sierra when it came out. I picked up TELL THE TRUTH, B. B. WOLF as soon as I saw it. I loved it. The story is about B.B. Wolf again and it takes place in the library. The librarian, Miss Wonderly, invites B.B. Wolf to tell his story of how he met the 3 Little Pigs. But he is a bit nervous. He says, "But I wasn't a hero." As in the first book, lots of other characters we love are part of the story. Rumpelstiltskin, The Three Little Pigs and the Little Engine to name a few. B.B. Wolf doesn't exactly tell the story as it happens. Instead, he twists things a bit and the crowd does not like it. Many of the listeners (including the pigs) demand that B.B. Wolf tells the truth. There is great word play embedded in the story. I love the line: "No one is falling for your story," cracked Humpty Dumpty. There are a few other fun words hidden throughout. Finally, B.B. Wolf admits that he wasn't so nice, tells the group he's changed and apologizes. He even changes his middle name from "Bad" to something much more fitting. And he figures out a way to make it up to the pigs. from "Somewhere Over the Rainbow"
But sometimes if you can't get your troubles to melt, at least you get some good news to sweeten things up -- our Poetry Friday Panel proposal ("Poetry Friday: Sharing Poems and Celebrating Poetry, One Blog at a Time") was accepted for KidLitCon! If you haven't signed up to go to Minneapolis (October 23), now you've got one more great reason: you can come chat about all things Poetry Friday with this great panel: Andromeda Jazmon of A Wrung Sponge, Elaine Magliaro of Wild Rose Reader, Laura Salas of Writing the World for Kids, Mary Ann Scheuer of Great Kid Books, Toby Speed of The Writer's Armchair, Amy VanDerwater of Poem Farm, and me of here. We're very excited to meet each other in person, and we can't wait to meet YOU and talk about poetry in the Kidlitosphere!! I even heard a rumor that the "founder" of Poetry Friday, Kelly Herold of Big A little a might be coming to KidLitCon. What are you waiting for? Go register now! Because sometimes it makes you feel better just to sing along, here's Israel Kamakawiwo'ole's version of Somewhere Over the Rainbow, and here's Judy Garland singing it. Elaine has today's Poetry Friday roundup at Wild Rose Reader. As I work on updating the nonfiction section of the library, I am thrilled with the books I am finding lately. JUST ONE BITE by Lola Schaefer is a great book for all ages. Because LIFE-SIZE ZOO has been such a hit, I think this one will be too. Although the illustrations are not photos like LIFE-SIZE ZOO, it is an over-sized book with great illustrations. Each spread gives information on one animal and what it can eat in one bite (or flick, when it comes to a frog.) The basic text is pretty predictable and inviting for new readers. The end of the book has more information on each of the animals included. There is a bit of invited prediction and a pull-out page, which are fun features for kids. I think this book would be a great lead-in to conversations about the food chain or any other animal unit that elementary students are involved in. So much information in such a simple book. UP WE GROW: A YEAR IN THE LIFE OF A SMALL, LOCAL FARM by Deborah Hodge is a book about farming. It is often difficult to find books for kids that show farms now, rather than in the past. Hodge writes a great book that follows the seasons on a farm--the work, the activities, the fun. The text would make for a great read aloud. It is packed in terms of information, but written in a way that is accessible to kids. The author stops to ask questions of the reader throughout the text which will make the book engaging. The photographs by Harris help to capture animal life on the farm along with the life of the family. THE BAT SCIENTISTS by Mary Kay Carson is the newest in the Scientists in the Field Series. This book is packed with so much great information. It is definitely a big read--for upper elementary kids, it would make a great read aloud or a great independent read for kids interested in the topic. The photos will draw readers in. The book includes great photos of scientists doing their work, diagrams of bats, basic information and more. The text is separated into short chapter-like parts. Extra resources as well as a glossary are listed in the back of the book. I bought this book because I'm a sucker for series books, and besides, you just can't have too many books with a guinea pig main character in your classroom library. Plus it's a mystery and a graphic novel all in one. Sasspants the pet shop guinea pig who, in book one, was called upon by Hamisher the hamster to solve a mystery because the g on her cage label had fallen off, making her a GUINEA PI (private investigator, get it? ), is once again needed to solve the mystery of where all the mice are going to. The pet shop is down to just one mouse, the pet mouse of the chinchillas, and the store is being haunted by a ghost to make things even more complicated and creepy. In spite of the clueless (pardon the pun) pet shop owner, the airhead goldfish, the vain chinchillas, and the rabbits who borrow one of the mystery books from Sasspants' personal library but need to be told what books are for: "READ them, don't EAT them!" Sasspants manages to solve the mystery of the missing mice. Last September, Franki reviewed the first of the Binky Adventures, Binky the Space Cat, and as soon as I laid hands on that book I was in love. This summer at the Kids Can Press booth at ALA (I'm beaming a million more thanks toward Canada even as I write), I got a Binky the Space Cat lanyard for my ID, which I've faithfully worn since the beginning of the school year. Imagine my chagrin when one of our reading support teachers came dancing in my room with HER copy of Binky to the Rescue before I had gotten MINE! As soon as Willie Morris was done reading his my copy when it arrived, I took it to school. I immediately gave it to the overworked Instructional Support Teachers in the office next to my classroom. They looked like they needed a laugh. One started reading it and giggling out loud and the other insisted on a read aloud. Soon I could hear the healthy sound of laughter coming from their office. Just about the same thing happened in my classroom. One of my most serious, get-down-to-business students was grinning (GRINNING!) and chuckling over Binky's belief that he's keeping the house safe from aliens (which are really just bugs), that when Binky falls out the window, he thinks he's in outer space, that he digs a tunnel to rescue his mousie Ted from the wasps, and that the story might not be quite over at the end of the book. You look like you need a laugh today. Go get your (cat's) copy of Binky To The Rescue! When we finished Clementine, Friend of the Week (my review here), our first read aloud of the year, I asked my class what kind of book they wanted to hear next. They wanted action, adventure, scary and longer than Clementine. Action? Tree climbing, stagecoach rides, near-drowning...Check. Adventure? Orphaned girl disguised as a boy running away from an evil uncle who wants her ten million dollar inheritance...Check. Scary? "The man at the bar wore black boots up to the knee, brown britches, and a brown shirt. The sleeves of his shirt were rolled up to the elbows; his large arms bulged out of his sleeves, and on one of the huge arms was...a tiger tattoo." Well, probably not scary by ten year-old standards, but it will have to do. "What in the hokie smokies..."
"How in the ding-dong dickens..."
Locust, or cicada, is chicharra in Spanish. I know this because as we were looking at the shells and corpses of cicadas that one of my girls brought in (you go, GIRL! ), one of my Spanish-speakers walked up and said with an authority that he does not have yet in English, "Chicharra." We all tried to roll our r's as well as he did and the more we said chicharra, the more we sounded like a bunch of cicadas in the trees. Say it! See what I mean?!? I love that my students are bringing their passions to school already in the third week, and I love that we are adding first-language words to our "juicy" words we're collecting. When the one-third of my class who were gone for Eid on Friday return this week, we'll see if there are words from their language and their celebration that we can add to our list and learn. 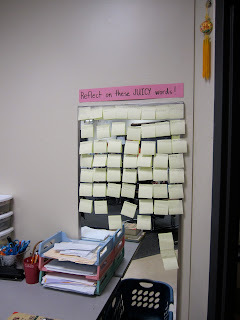 This is the best solution for covering our classroom's mirror that I've ever come up with -- "Reflect on These JUICY Words." 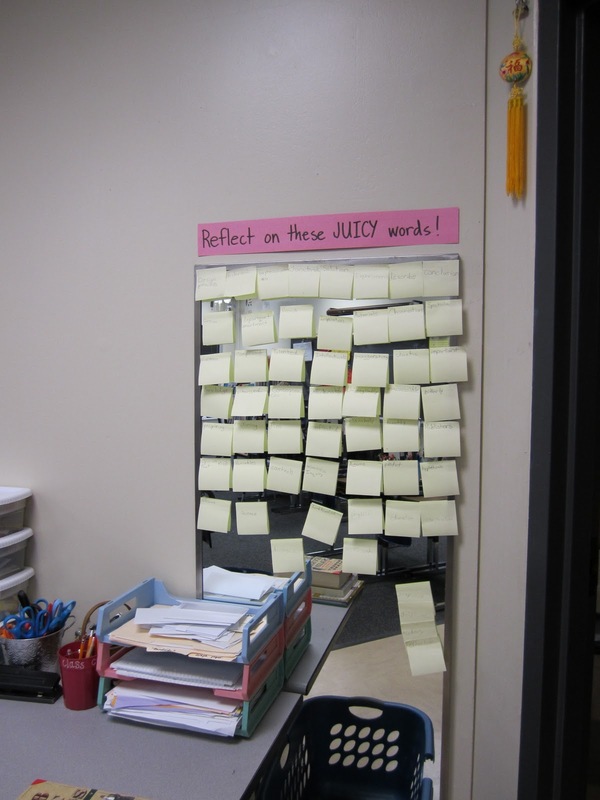 The classroom assistant has a pad of sticky notes, and whenever anyone come across a "juicy" word in the book they're reading or I'm reading aloud, in class discussion, overheard in a conversation, etc., they help the assistant put it on a note and post it on the mirror. Every so often, I type the newest juicy words onto a blank page in the SmartBoard software. This is our electronic Word Wall! I've made each of the words on the word wall a piece of movable text so that we can sort the words, looking for similarities and differences, categories, parts of speech, prefixes, suffixes, etc. Soon we'll need to make a second page, we've collected so many words. I can't wait to see how this Word Wall project develops. Out of all the ways I've tried to integrate my new SmartBoard into my teaching, this is my favorite so far. Good thing our phone was on the fritz a couple of weeks ago. 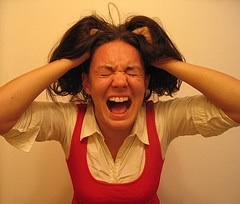 That meant we didn't have Internet access on a Tuesday night when all my work depended on getting online. Needed to pay bills. Little stuff like that. We packed a book to read (him), a computer (her), and went to Scotties, the nearest Free Internet With Your Cup of Coffee joint that we could think of. I was (more than) just a little tired and crabby about not being able to work at home in my jammies and then fall right into bed. As we walked into Scotties, my ears went, "Is that LIVE music?" and the crabby started to leak right out of me. Four old guys were playing 1940's-60's tunes on electric guitars that were amped but not cranked. They sounded like my childhood guitar teacher, Rudy Schlichenmayer. They sat slouched over their guitars in a wide half-circle so they could watch each other and riff off each other. When they sang, their voices sounded like the records my parents used to play. My crabbiness left me. I started noticing that they weren't really all that old, now that I'm on the near side of old myself. They were probably in their 60's. They obviously liked each other and enjoyed getting together to have a public jam session. I got my work done. We checked the schedule. They play every Tuesday night. I'll be there whenever I can. as I want to it would turn to pain. I took the pictures. (It's the same butterfly, showing off her outer and inner beauties.) I found the poem at The Writer's Almanac and couldn't figure out a way to divide it. Hopefully the copyright police will allow me this rare indiscretion. The roundup today is at Picture Book of the Day, hosted by Anastasia Suen. Happy Friday! And, hey, don't let your happiness get away from you like a butterfly that doesn't sit still for a picture -- pay attention to your happiness and enjoy it NOW, while it's right there in front of you! THE BOSS BABY by Marla Frazee is hysterical. The story starts out with these words, "From the moment the baby arrived, it was obvious that he was the boss." The story goes through those typical things new parents go through dealing with the demands of a new baby 24/7. The illustrations really make the book what it is. The baby is dressed like a top executive--in a suit and tie. He sets up his office in his bouncy seat and "calls meetings" from his crib. You will LOVE this baby! I bought KIKI's BLANKIE by Janie Bynum because I immediately fell in love with Kiki the monkey. She is ADORABLE. And she LOVES her polka-dot blankie. (My favorite page is when she is using it as a beach towel, laying out wearing sunglasses.) Kiki never goes anywhere without her blankie and then she loses it. She has to have courage to get it back. She so loves her blankie! This would be a fun companion book to Knuffle Bunny by Mo Willems. I found out that the author of DEAR TYRANNOSAURUS REX, Lisa McClatchy, lives in Columbus. I had so many kids looking for books with dinosaurs this week in the library, that I am sure this will be a popular one. It is a cute story of a little girl who sends a letter to the dinosaur in the museum, inviting him to her birthday party. The book is actually her letter. She tells him all of the great things that will happen if he comes. Each page begins with, "If you come to our party...". I think this would be a great mentor for writing. Each page uses the repeated phrase to give a detail about the birthday party. The ending is a fun surprise! A colleague at work shared THE ROBIN MAKES A LAUGHING SOUND with me and I ordered it right away. I loved this book for lots of reasons--even though I know almost nothing about birds and I am not a bird-watcher. Our library overlooks a courtyard and it would be a great place for bird watching if I can figure out how best to set up feeders to attract them. Until then, I am picking up great bird books for kids. This one may be my favorite. The intro of the book is a note from the author, telling us that her 7th grade teacher introduced her to bird watching and describes some of the work that she did in that class. She has been hooked ever since. The rest of the book is a birder's journal. It is filed with poems, sketches, observations and more. The pages are made to look like a real journal--with some things taped in, etc. There is a variety of writing and I can see kids learning so much from this book--both as a writer and as a scientist. When I was in the classroom, I always looked for great books that showed how writers worked in the real world. This is a great example of a "writer's notebook" to share with students if you use notebooks in your classroom. It might invite kids to try new things in their own notebooks. Now that the kids in the library are totally excited about books they can sing because of PETE THE CAT, I am on the lookout for new books with downloadable songs. I so love the work of Rebecca and Ed Emberly that I was excited to see IF YOU'RE A MONSTER AND YOU KNOW IT just in time for the Halloween season. This is a new version of the classic song, "If You're Happy and You Know It." But it takes on a fun twist asking kids to do things like "smack your claws" and "twitch your tail". Just as with other books that are coming with songs these days, there is a fun song that can be downloaded for singalongs or just listening. It is at Scholastic's site along with other information on the book. As with their other books, the illustrations in this one are bright and colorful and set against black. I think if I put bright paper out, kids will have a great time trying to create some of their own monsters using Emberly's art as a mentor. I have been waiting patiently for my copy of A PIG PARADE IS A TERRIBLE IDEA by Michael Ian Black. Since I LOVED, LOVED, LOVED CHICKEN CHEEKS, when Bill at Literate Lives shared this new one, I ordered it right away! A PIG PARADE IS A TERRIBLE IDEA by Michael Ian Black is a crack up! This book would make for a great fun read aloud. This is a great book about all of the reasons that a pig parade is a bad idea--my favorite reason is that "pigs absolutely refuse to wear majorette uniforms". There are many, many reasons that the authors give us, but that one was my personal favorite. The humor is quite sophisticated and I will have to try it out but I am pretty sure it will make my BOOKS I COULD READ A MILLION TIMES list. 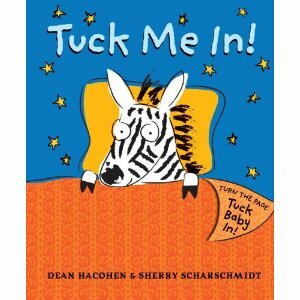 I could see using this book in writing workshop as a great mentor text for persuasive writing. (If you do use it for writing workshop, please, please, please make sure to read it aloud to your kids a few times first--just for the fun of it.) The authors begin the book with a great lead about thinking that maybe a pig parade might be a good idea. Then they go through point by point and explain why this is a terrible idea. At the end of the book, they summarize again why this is so bad. When I did units with upper elementary kids on persuasive writing, finding great examples was often a little bit difficult. I'd find a few things online and lots of op ed pieces, but there weren't many great picture books that kids could study to learn about persuasive writing. This book is one of the best pieces of persuasive writing I have seen. Readers are clearly convinced by the last page, that a Pig Parade is definitely a terrible idea! Last week was the first week that I saw classes in the library. I have been thinking hard about where to begin this year and about the big goals for the students. Because this is the 3rd year I've had with these students, I have an idea of where they are when it comes to the way they use the library. I have worked over the past few years to focus on the tools in the library and about building independence. This year, kids will be checking out themselves so that we are freed up to do more work with students as they dig into their learning. After looking hard at our state Library Guidelines and thinking about the skills our students need to be literate in the 21st Century, I wanted to move to a new level of what kids could do in the library. I continue to refer back to NCTE's definition of 21st Century Literacies as I think and plan. When I watched the TED Talk on The Marshmallow Challenge, I knew it was the activity I wanted to kick off our year in the library with. So, this week, every 3rd, 4th and 5th grade class participated in the Marshmallow Challenge. Each team of 3-4 had 18 minutes to create a structure using the materials included with a big rule being that the marshmallow had to be on top. I had several goals when I decided that it was worth counting out so many pieces of uncooked spaghetti. First of all, I want the library to become a schoolwide community. One challenge that is different from the classroom is that not all members of the library community are in the space at the same time. So I need to connect their conversations in different ways. I knew that if I did this with all 3rd, 4th and 5th graders, it would become a topic of conversation on the bus, at dinner tables and at recess. From what I heard from the kids, I was correct in my thinking. I will also expand on the conversation by creating a display in the library highlighting some of the things that each group created and learned. I also want the library to continue to be a place where kids can create--we'll build on the work with film-making that we did last year, do more content-connected projects, etc. and I want them to have thought hard about collaborating and problem solving. So, every 3rd, 4th and 5th grade class spent the first 18 minutes of their library time this year participating in THE MARSHMALLOW CHALLENGE. ( I let them use tape on the base which may be against the official rules, but I think that was the only difference.) I learned so much from watching the groups. I know that if kids are going to use the library in the ways I hope they do, collaboration is key. It was interesting to watch them share ideas, deal with frustrations, and stay focused (or not) on the task. The powerful piece was the conversation kids had afterwards. The challenge is designed so that groups MUST collaborate. There is not enough time to not collaborate. So the conversations following the Marshmallow Challenge about collaboration were key. It seems that many young children think that collaboration is about being nice, being a team player. But I think when I look back at the work in 21st Century Literacies, I want more than that for our kids. I want them to problem solve collaboratively--to listen to others' ideas, build on people's thinking and to be able to create ideas and projects together that they could not possibly create on their own. "When something messed up, we didn't complain. We laughed and fixed it." "It is better when you talk before you work. "We learned from our mistakes and to combine ideas to make something we like." This led right into a conversation about creating because they quickly realized that so much of collaboration comes from problem-solving when things don't go well. We also talked about creation and the fact that trying things that didn't work forced them to think about a new way to do something. So many kids are so worried about doing things the right way and not making mistakes that I loved this part of the conversation. For the classes I've seen a 2nd time, I did a quick 15 minute follow-up activity using Marbleworks. Kids were again assigned to a team of 3-4 and we talked about setting challenges or goals for ourselves. For the last few years, kids have been doing lots of great exploration with many of the building toys and games. Although I think free exploration time is important, I also want to bump it up a bit since it hasn't happened naturally. I want the toys to be a source of independent hands-on research. So, I gave kids a challenge--"In 5 minutes, create the tallest structure you can with only 8 pieces." The 8 pieces threw them a bit but they quickly took on the challenge. We discussed the difference in free play and committing to a challenge and they talked again about having to dig in and try new things when something didn't work. Then they brainstormed other challenges that kids might try with Marbleworks. (Build a track in which the marble goes through all of the pieces. Build the lowest structure you can that works and used 8 pieces. Create a track that takes exactly 45 seconds for the marble to travel on.) I will add these challenges and spaces for kids to add new ones to the area around the Marbleworks--inviting others to think differently about the way they design. I think this piece will be key when it comes to research--asking your own questions, finding answers, documenting work over time. For young children, this step will help them understand more text-based research. I'm glad that we started the year like this. Yesterday, I developed the 180+ pictures that I took and will add those to a wall display near the door, along with quotes from the kids on what they learned about collaborating and creating. I am hoping that conversations will begin to happen across classes and that kids will see things in the pictures that spark new thinking and talk. I have always believed that it is these yearlong conversations that make a difference to student learning and this one on creating and collaborating will be one we add to every week throughout the year. No, I didn't forget to do my monthly mosaic, it's just that August kind of galloped away from me, what with school starting so early this year. 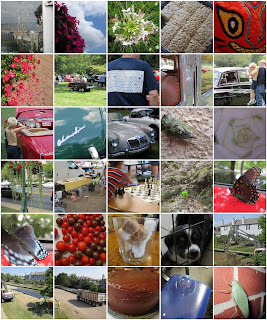 My favorite images of the month are of the little boy taking pictures at the British Car Show in Dayton (click on mosaic once or twice to enlarge). He was so passionate! He'd take a picture, look at the image he'd captured, say, "Yes!" to himself, and find another shot to take. It killed him that he couldn't see inside the Rolls, but his dad helped him out with that one. I wanted to ask him what he would do with or make with his pictures. I imagine him at home at the computer sorting them, organizing them, writing about them, maybe making a mosaic with them! No, that's not our new puppy. Perhaps in a year we will have a pup from that breeding pair. (It's an English Shepherd -- a herding dog that looks a lot like a robust Border Collie, but with a calmer disposition and an upright herding style.) In the meantime, we help out the breeder by doing temperament testing to help her place the pups in the right homes. Here's a video I made of two of last year's pups tussling. This was a good month for photographing insects! For one thing, I got a new camera that allows me to get lots closer (and do fun stuff like miniaturizing and fisheye-ing.) But the camera's nothing if the subject's not there! The cicada was on the school building, the butterfly was on my car, and the katydid was on our porch wall. How about those red eyes?!?! farmers, miners, lumberjacks and foundry workers. Here's hoping you have an enjoyable Labor Day weekend, whether that means a long weekend of rest, or a long weekend with a long to-do list (sigh). Susan has the Poetry Friday roundup this week at Susan Writes. Whenever I start getting overwhelmed by all the paperwork and meetings and soothing of petty quarrels on the playground that my job entails, I think of the mountains of work the President has to face day after day for four years (and with hostile legislators and press corps thrown in for extra measure), and somehow, I can face another day of lunch duty or another set of papers to grade. In Walton's humorous look at an overwhelmed President, the way he manages to survive the demands of nutball splinter groups (the National Gopher Society), uncooperative cabinet members (can you believe what the VP did to the ping pong table?!? ), and quarreling world leaders ("It's the Sticks and Stones issue again sir. What should we do?") is to put on a disguise, walk a few blocks from the White House, and rejoin his kindergarten classroom. It is there that he remembers everything he learned that will help him to do his job: "It's hard to solve problems when you're hungry," "Polite people always raise their hands," and the hokey pokey is what it's all about. I nominate Mrs. Appletree, the teacher who reminds us that we really did learn all we need to know in Kindergarten, if only we would have the courage to live by those simple rules, for our Cool Teachers in Children's Literature. "When Ida started school, she took her new lunch box...and Dotty." Dotty is Ida's red spotted, horned (imaginary) monster friend. And Dotty's not the only monster friend in Ida's classrom -- it is quite full of friends of all sizes and shapes. As the year goes on, however, many of Ida's friends stop bringing their friends to school. When Ida's Dotty gets mad at another girl and pushes her, Ms. Raymond, the teacher, makes both girls write apology notes. After school, Ms. Raymond talks to Ida about Dotty, telling Ida to "explain to Dotty that we don't behave like that at school." When Ms. Raymond goes to get Ida's blue string for Dotty out of her desk, she comes up with a red string...for her own (imaginary) monster, Gert. This is a sweet story about how imagination is sometimes lost as we grow up, and sometimes never lost at all. Especially not if you teach very young children and your classroom gets crowded with monsters at times. Ms. Raymond is definitely one of our Cool Teachers in Children's Literature!